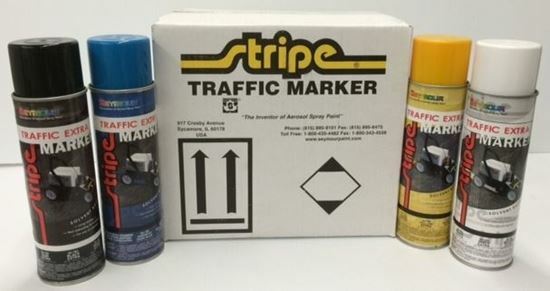 A long lasting traffic marking paint specifically formulated for line striping over freshly coated asphalt. Fresh sealcoat will not ‘bleed-thru’ this paint unlike other striping paints. Approximately 250 linear feet per can (4″ wide stripe). The sprayhead is universal and works in our #Z-604 traffic machine as well as competitive marking machines (like Fox Valley's Superstriper). For marking stencils or curbs, it can be actuated by hand or with the #Z-608 traffic marking wand. Traffic ready in 60 minutes and VOC compliant. The paint can be shipped Ground only.